One graham cracker dipped in white chocolate, plain or drizzled with another chocolate color and flavor. Packaged in a heat sealed cello bag to preserve freshness. 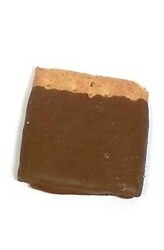 A delicious combination of rich chocolate candy and crunchy graham crackers. 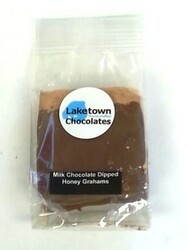 Makes a great food gift or affordable promotional giveaway. Includes up to 4 color process imprinted label applied to the bag. Available in milk and white chocolate versions with or without toppings..